Preheat oven to 400. 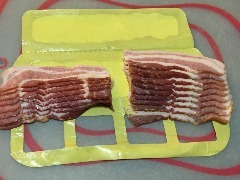 To prep cut your bacon in half so that you can get more wraps out of it, but you can use an entire strip of bacon if you like. You can't go wrong with bacon! Line a cookie sheet with foil and grease it. Pull the pits from the dates if you did not purchase pitted dates. 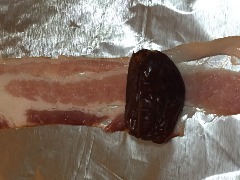 Place your bacon strip down with a date and wrap up like a little sleeping bag. Optional: You could place a half of a walnut inside the date and then wrap it to give it a little more crunch and a different flavor. Place your little bundles of deliciousness across the cookie sheet and place in the oven. 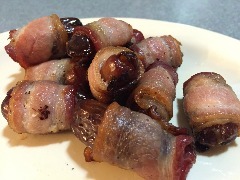 Cook for 18-20 minutes until bacon is cooked and crispy. Joe's Favorite Paleo Treat- Recipe from the Man Himself! Going paleo has been a challenge, but little treats like this make it a little easier. A couple years ago, I was down in Pinehurst playing in a golf tournament and stayed with a friend of mine. 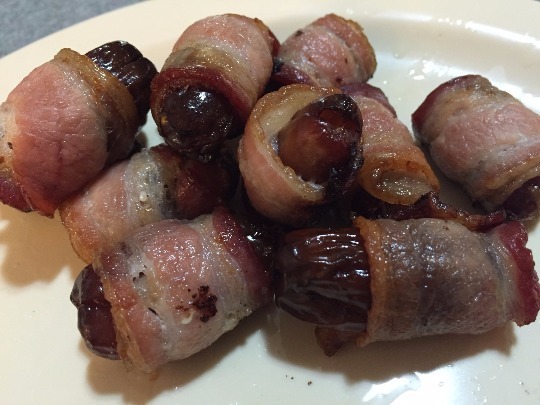 His wife asked me if I wanted bacon wrapped dates and my initial response was bacon wrapped what? After they explained them to me and I got the courage to give one a try, my mind was blown! How could something so small and simple taste so good?!? I would like to think my success at that tournament was due to the amount of these little things I ate, but I could not wait to eat them again. As I began looking for snacks that I could eat that were also paleo, I was excited to learn that these qualified. I've already had them twice and I see them in my future as least one more time before this month of paleo is over. The best part, I can eat these whenever, not just when I am going paleo. Looking for the ultimate snack that anyone, paleo diet or not, can enjoy. 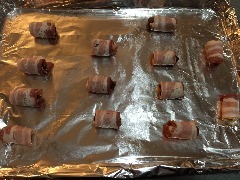 Give these bacon wrapped treats a try because where there's a meal, there's a way!